Planning a surprise confetti toss is an easy to way to give special attention to the person you’re celebrating and isn’t costly or time consuming! 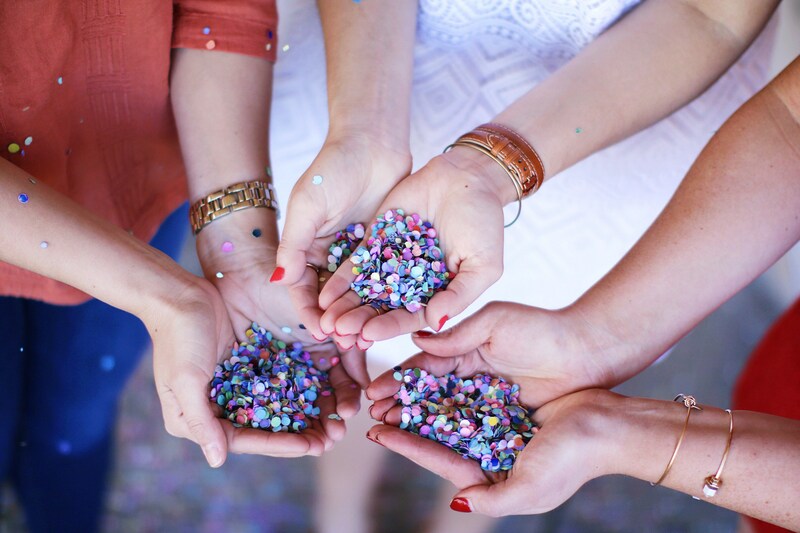 Confetti is always a good idea and can turn boring celebrations or mundane days into colorful memories. It works every time. As a part of my birthday celebration 2 years ago, I grabbed my closest girlfriends and we hopped in a limo and took photos around Dallas, ending with a confetti photo shoot downtown. It was definitely a highlight and I love looking back at those photos and remembering the fun time I had with those friends; I know it can be the same for you! Next, with your photographer ready, attack your confetti victim! Third, laugh and repeat. Once your friend figures out what’s happening, they’ll want to keep playing with the confetti, I promise! If the “toss & run” method of confetti surprises won’t work for you, you could also have your target sit in a chair and blindfold them- even though they know a surprise is coming, they won’t know what to expect. Untie their blindfold and throw (toss!) the confetti. Be sure to snap some photos because their facial expressions will be priceless! 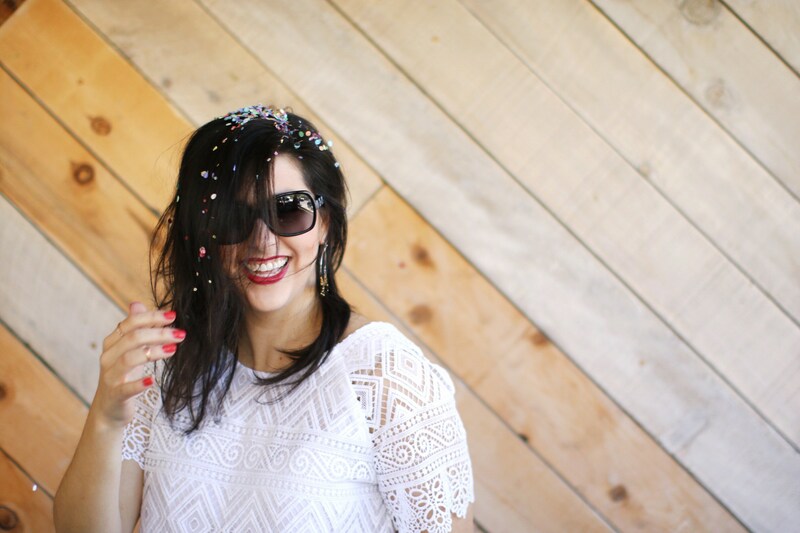 Confetti is my favorite for birthdays, but you could easily use confetti to celebrate a recent engagement or graduation. 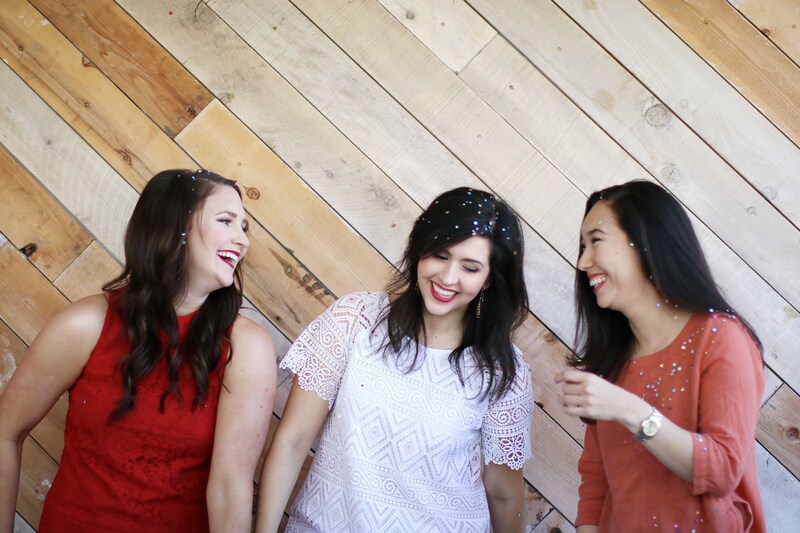 Don’t be fooled into thinking that it has to be a holiday or a special occasion for you to have a confetti photo shoot; why not throw a “because it’s Tuesday” confetti party or encourage a friend with a confetti surprise just for fun?! I love to celebrate… everything. Even the everyday wins deserve to be recognized and celebrated. I asked a couple of my girlfriends (Kari from Sophisticated Whimsy and Lisa) to help me with this post and to celebrate with me: it’s spring and I’m not wearing a brace on my wrist anymore for the first time time fracturing it in February! Definitely worth of celebrating. Go surprise someone! Outfit details: I’m wearing a lace dress that is perfect for spring celebrations. I paired it with these fringe stacked heels and beaded earrings to keep it modern and casual.